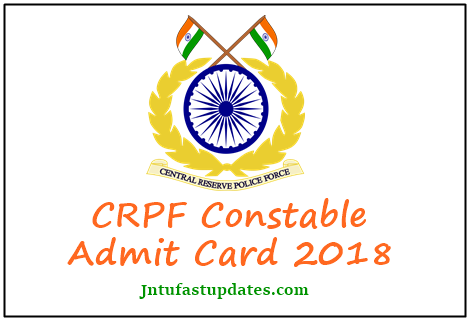 CRPF Constable Tradesman Admit Card 2018 for constable/GD posts is going to be accessible shortly on CRPF official website, crpf.gov.in. Central Reserve Police Force has scheduled the Constable GD written test on 16th September. All the hopefuls who are going to appear for CRPF Constable GD written test on 16th September can download the hall tickets from few days before the examination. Hopefuls must download and take a printout of the admit card to carry it to the examination. Without showing the admit card candidates will not be allowed to the examination. Hence all the hopefuls must download and preserve the admit cards to carry to the examination. More details such as admit card release date, timings of the examination, instructions to CRPF written test and others were listed in the following article. CRPF (Central Reserve Police Force) is established on 27th July 1939. It works under Ministry of Home Affairs for Government of India and is one of the oldest Central Para Military Forces. Before 28th December 1949 it is named as Crown Representative’s Police but after independence, it was renamed as Central Reserve Police Force. The main duty is to maintain law and order and counterinsurgency it is one of the largest paramilitary force. The CRPF has notified 139 Constable (GD/Tradesmen) posts in the month of July. Candidates aspiring to get CRPF constable posts have applied from 3rd August to 31st August. Many of the hopefuls have applied for the CRPF Constable posts this year. As per reports, the first candidate should qualify Physical Standard test and Physical Efficiency test written test scheduled after completing this exam who clears the test then those candidates will call for personal interview. The CRPF official career portal crpfindia.com in this they have mentioned all details; the candidates can check the details of the PET/PSC/written/Medical test. Applicants can get the CRPF Constable GD/Technician Admit Card before 10 days of the examination, reportedly. After downloading the hall ticket, candidates can check the details of their examination center, date, timings of the examination and other important guidelines from it. The competitors with admit cards will only be permitted to written test and other rounds. Hence all applicants have to attend the rounds with CRPF Constable admit cards without fail. Candidates can verify their name, DOB, gender, scanned photograph, signature, and other details. Step 1: Initially, go to CRPF Official website, crpf.gov.in OR Click the direct link mentioned above. Step 2: Search for Constable GD/Technician Admit Card / Hall Ticket 2018 link, and click on it. Step 3: Fill in the details of DOB, Registration Number Etc. Click on Submit Button. Step 4: Admit Card will appear on the screen. Press Ctrl + P to take a printout of it.